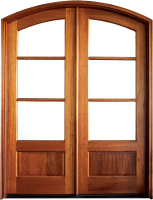 What Is a French Door and When Would You Use One? True divided light doors, also known as French doors, are made up of panels or panes of glass, separated by wooden partitions or frames. The panes of glass are typically rectangular, and they make up most of the door’s surface. French doors are elegant and stylish. When installed in an exterior wall, as access to a deck or patio, they’re a fabulous way of increasing the natural light available to your home. When used inside the house, they are an effective way to divide space while still having a more open feel than you would with a conventional door. As a design feature, French doors can be transforming. French doors are beautiful and also functional. Form and function can go together when you use your French door to join interior and exterior elements. A French door that opens onto a patio or a balcony brings the two spaces into harmony, and outdoor and indoor living spaces become one. You can use French doors anywhere in your house, and you don’t need to feel that you can only use one or two. You can actually create a design theme by using several pairs of French doors. This gives the home an incredibly open feel. Because French doors are made primarily of glass panes, they give a sense of openness and space even when they are closed. French doors are so versatile, that sometimes people use them as walls. Several French doors are locked into position with a post or a bolt, and treated as a stationary fixture. When this sort of treatment is used instead of a wall, the space is open and bright. Visitors to your home can’t help but be impressed. French doors are so versatile and so attractive, and they’re even a good investment. They’re so transforming to the appearance of your home, that adding a French door can increase the resale value of your house. Ordinary rooms become remarkable, and it’s just common sense that a remarkable-looking house is going to attract more, and better, offers than one that’s simply humdrum. French doors in the interior of your home will work to your advantage in numerous ways. Foremost is that louvered or sliding French doors maximize the use you get out of a room, because no space has to be lost to allow the doors to open or close. The extra space you gain can be used for furniture or decorative items that enhance the livability of your home. So, you have all the space you would have had if you’d used an archway between your rooms, but more versatility because you can use the French doors to close one room off from another, or open them up again. You wouldn’t be able to do that if you’d used a typical connecting door. You can also save on heat or air conditioning because you can close off the areas and only cool or heat the part of the area that you’re actually using at any given time. If you’ve never considered French doors, give them some thought. French doors are a stunning addition to any décor, and they’re practical, too!